Intel Xeon X5687 in a Dell Studio XPS 435mt? Is there a trick to getting this to work? I have seen where people get Xeon W36XX processors to work in the 435t. RE: Intel Xeon X5687 in a Dell Studio XPS 435mt? Its nowhere near simple. Bios should be updated to latest before trying IMHO. 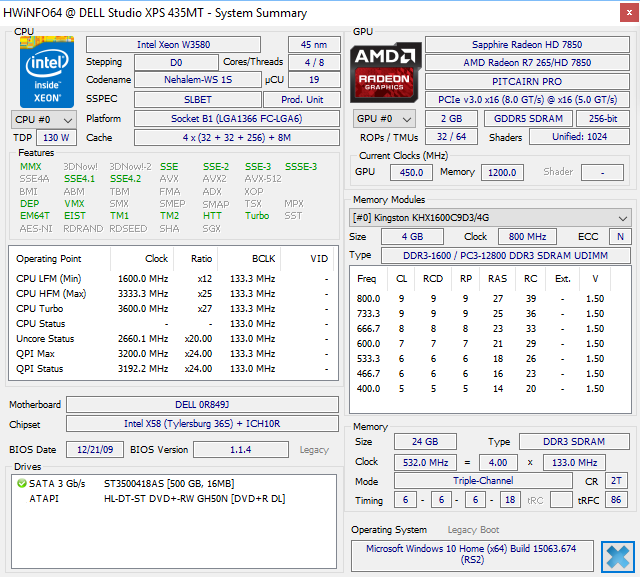 I'm typing this from a Dell Studio XPS 435T/9000 (Tower) with a Gulftown / Westmere EP Xeon W3690 (6 cores, 3.46 GHz). The reason this CPU works in a 435T is because Dell added Gulftown (and by extension Westmere EP) support with one of its last BIOS updates (A15 BIOS). Note the "Update BIOS to support new intel CPU (Gulftown) launch" under the A15 "Fixes and Enhancements". Gulftown / Westmere EP Xeons include the W36xx and X56xx series. The W3690 is the fastest in its series and I'm using it with my 435T, so a 435T should be good with any other processors in the W36xx series. The W3690 seems to be the fastest Xeon hexcore for the 435T (equivalent to a i7-990X). I have not tested the X56xx series in the 435T. However, it you go through the benchmarks on userbenchmark.com for the 435T/9000 here you'll find one running the X5687 (fastest in the X56xx series). This one. So, it looks like the X56xx series should work with the 435T. The X5687 seems to be the fastest quadcore that works with the 435T. I've also tested the 435T with the Xeon W35xx series (Bloomfield), and can confirm the W3580 (fastest in the W35xx series) and W3565 work in the 435T. On the other hand, Dell never updated the Studio XPS 435MT (Mini Tower) BIOS to support Gulftown / Westmere EP. This limits the 435MT to Bloomfield processors, which only go up to 4 cores. For the 435MT (Mini Tower), any Bloomfield processor should work. Best you can do is a i7-975 or its Xeon equivalent, W3580, both are quad core at 3.33 GHz. Any of the Bloomfield Xeon W35xx series should be ok with the 435MT. I do have a 435MT (Mini Tower) which has the above mentioned Bloomfield Xeon W3580 in it, so I can confirm this works. Without overclocking there's no practical difference in performance between the 3.2 GHz processors when used with the 435MT. For example, buying the i7-965 (which has an unlocked multiplier) over the i7-960 provides no advantage for the 435MT without overclocking. Also, there's so much bus bandwidth with only one 16x PCIe slot in the 435MT that 4.8 GT/s QPI vs. 6.4 GT/s QPI bus speed doesn't matter. Same with W3570 vs. W3565. However, since the 435MT can now be overclocked if the CPU has an unlocked multiplier, that could be a major factor in choosing between one of the 3.2 GHz processors. HWiNFO64 screen capture showing details of a Studio XPS 435MT (Mini Tower) with a Xeon W3580 in it. Xeon W3580 is shown in upper left hand corner. SAPPHIRE Radeon HD 7850 2GB 256-bit GDDR5 Video Card, model 11200-00-20G (the Non OC version, which runs by default at Reference 860MHz Core Clock). This GPU is pushing the limits of what will run with original 360W PSU. A GPU model that runs at low reference clocks was explicitly chosen to make sure it would work with the original PSU. I've never tried to OC the GPU on this machine. In addition to the Bloomfield Xeons, I suspect the Gainestown 55xx series Xeons might work as well in the 435MT. Both use the LGA1366 CPU socket. Gainestown came out from Intel about the same time or just before Bloomfield, so support for it is likely in the microcode for the 435MT. To my knowledge, no one has tried a W55xx yet with the 435MT. I'd probably stick to the W35xx Bloomfield Xeon series for the 435MT, especially since the W55xx Gainestown series all have locked multipliers and can't be overclocked in the 435MT. But, the W55xx series would be worth a try if cheap and/or the W35xx series isn't available and overclocking isn't a factor. As I mentioned, prices were from ebay, not amazon. Shop around. ebay is almost always cheaper than amazon. Here's a W3580 that sold 2 days ago on ebay in the U.S. for $16.06 with free shipping. And here's a "Buy It Now" current listing for a W3580 on ebay in the U.S. for $28.00 with free shipping. Ebay however has shady dealers that steal your money. I ordered 8 units at $29 for a total of $232 and they said back ordered after they took my money. Then they split the original order into 2 and 6. Then they waited another week and shipped 2. Then they said out of stock. They then re listed the same part at $59 each and said I had to re order if I wanted the other 6. I disputed the entire charge with AMEX. They have yet to contact me about the difference. Ebay was not helpful at all. This is why I will not tie my ebay account to a bank account because they will ALWAYS Debit your bank account so that they don't have to refund your money. Its been about 4 weeks now and I don't think the Ebay seller will try to work things out. I haven't used the 2 that I got since I may still send them back to the vendor. Sellers remorse is rare but happens. Sorry to hear that. Unfortunately, there are unscrupulous sellers in any market. Caveat emptor. I've purchased several Xeon processors on ebay as well as from 3rd party refurbishing resellers. Haven't had an issue. I only deal with sellers with high positive feedback on ebay and even then weigh any risk. I also favor U.S. sellers. $30 for a CPU vs. the $200 you posted above? - worth it. Not sure the seller is shady. The seller may have sold the 6 through another selling venue and not been able to update the quantity on ebay before you bought it. That's understandable. But, would be nice if they honored the original price. But then again, they may no longer be able to source them to make a profit at that price. I'd take the 2 at $29 and shrug my shoulders at the rest (6) - meaning not try to get the additional 6 from that seller, but cancel the order for 6. First I'd take the seller's communications saying they're not going to deliver the 6 at the originally agreed upon price to ebay and ask that the price for 6 be credited to your card and order for 6 be cancelled. I think given seller's communication ebay would see that as totally reasonable. Then I'd just buy the additional 6 you wanted elsewhere. But, how you handle it is up to you.